The B9Creator v1.2 arrives as a complete unit, ready to calibrate and print. 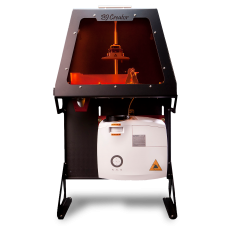 The B9Creator v1.2 has been built to factory specifications, started, and tuned by technicians in our factory to produce high-resolution prints right out of the box. Each machine comes with the calibration settings documented and the final calibration print included in the box for owner verification. Along with your B9Creator v1.2, you will receive one kilogram of B9R-3-Emerald Casting Resin, two B9 Resin Vats, a B9Creator Calibration Grid Set, and a 1-year warranty. The software for the B9Creator v1.2 is free to download now and give it a try. View the B9Creator v1.2 spec sheet. Important Note: The B9Creator v1.2 requires a host computer with an available USB port and secondary video output (VGA or HDMI that supports 1920 x 1080 resolution). The B9Creator v1.2 - CE has a temporary 2-week lead time between receipt of payment and machine shipment. Our team at the factory is working hard to bring the B9Creator lead times down to 2 business days as soon as possible. A castable resin pigmented for thin slicing and sharp details.B9R-1-Cherry: 1 KG (2.2 lbs) bottle. &..
B9 Resin Vat (container)Ships with a factory applied PDMS coatingBuilt-in pour spout makes transferr.. Provides clean burnout without staining the investment, enables casting of thicker objects, and prin.. Premium casting resin with the cleanest burnout and no ash. Prints with excellent detail to show the.. The B9 Model Cure is a compact, high-intensity UV post-curing solution for resin models in applicati.. This upgrade provides the owner with the B9Creator Software in Spanish. All menus, settings, p..